Parsons, Hon. George M. (1818-1895), Columbus Ohio multi-millionaire. He was married to Jane Parsons. They had six children : Elizabeth (1846-), Amelia (1850-), Jane (1852-), Gustavus (1855-), Mary (1857-), and Anna (1860-). In 1860, he lived in Montgomery Township, Franklin County, Ohio, with an estate estimated at $550,000. However, the 1870 Census states his residence was in Columbus, Ohio, with an estate estimated at $375,000. He died at the age of seventy-seven on September 19, 1895 at his residence in Columbus, Ohio. One of his daughters is Princess De Lynar of Dresden, Germany. His first coin and medal collection comprising 508 lots was sold by Edouard Frossard, 47th sale, at Leavitt, on October 16, 1885. Adams rating B+. His second coin and medal collection of 2,756 lots was sold posthumously by Henry Chapman, 24rd sale, at Davis & Harvey, on June 24-27, 1914. Adams rating A . Martin Gengerke lists this auction has having 2,765 lots. Fig. 1. 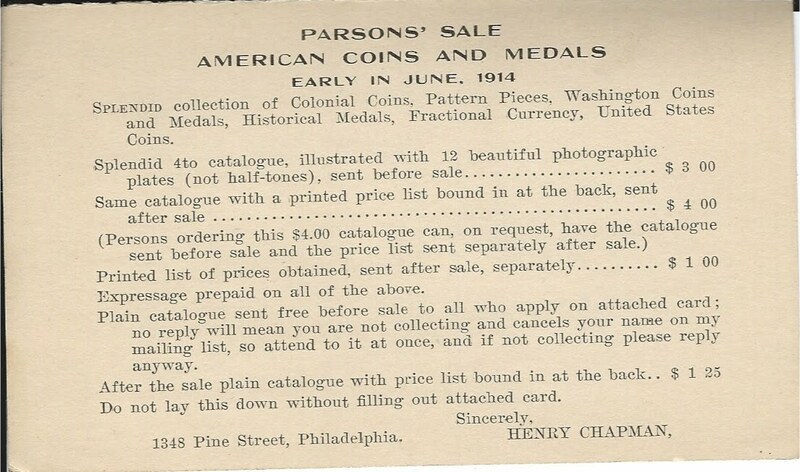 Henry Chapman's circular postal card advertising the Parsons sale in June 1914. Courtesy of the Lupia Numismatic Library, Special Collection, The Chapman Family Archive. Henry Chapman, Catalogue of the Magnificent Collection of American Colonial Coins, Historical and National Medals, United States Coins, U.S. Fractional Currency, Canadian Coins and Metals, Etc. Formed by the Late Hon. George M. Parsons, Columbus, Ohio(1914). The New York Herald, Friday, September 20, 1895, page 12 (Obit). American Journal of Numismatics, Vol. XXXIX, April (1905) : 108 refers to his article on Franco-American jetons and medals. Lorraine S. Durst, United States Numismatic Auctions. Nos. 701 and 878.